More than 70% of the earth’s surface is covered by oceans and the life contained within them is simply amazing in variety and quantity. The ocean is also home to more than 90% of the living biomass on earth. The tree main groups of fish (previously simply referred to as the Class Pisces) represent the single largest group of chordates on earth and over one quarter of them can be seen on tropical coral reefs, adding to the enviable reputation of coral reefs as ecosystems with no equal anywhere in the world. Shallow-water and off-shore hordate animalsore than 90% of the living biomass on earth is found in the sea. 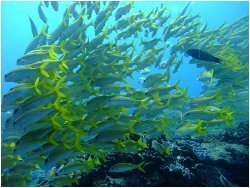 Fish represent the single largerst tching yourcoral reefs, estuaries and coastal tidal pools offer diverse marine environments that can be explored through recreational activities like diving and snorkelling. If you are intrigued by form and function in nature, the variety of marine organisms that can be seen while snorkelling in these environments, will no doubt provide for stimulating journeys of discovery and many years of exploration. While diving is a more technical activity with some limiting factors such as health or affordability, snorkelling provides a fairly easy and inexpensive way to explore our marine and coastal areas. Snorkelling is often a much more accessible activity that most people can enjoy and learn from. It is a great activity for guests of all ages and can be enjoyed as a basic activity or a more adventurous one that requires more skill –but also offers more reward. Snorkelling offers the irresistible opportunity to peek into a mysterious hidden world. One that is normally only available to qualified divers or in contained environments such as aquariums or television screens. A well planned and guided snorkelling safari is almost guaranteed to offer instant understanding of why people become so passionate about marine life. 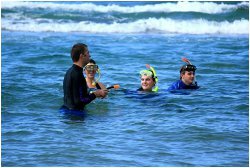 In South Africa, the northern coasts of KwaZulu Natal (also known as Maputaland or the Elephant Coast) where the southern-most tropical reefs in the world are found offers some of the best local snorkelling sites. 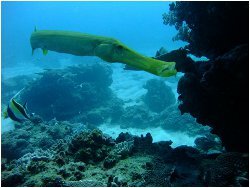 There is a great variety of basic and easily accessible sites, while the sufficiently fit and experienced snorkeler can venture deeper toward some of the off-shore reefs where a chance encounter with some of the pelagic species such as dolpins, whale-sharks, turtles and Manta Rays are possible. A planned, guided snorkelling safari can turn an average experience into a journey of discovery that can be remembered for many years to come. Using the equipment is no difficult task to master, but having the knowledge and insight to snorkel safely, under the right conditions at the most appropriate sites requires a good amount of skill, knowledge and understanding of the ocean. Having a guided snorkelling safari therefore has many benefits to the guest which include access to knowledge of local sites through the guide, knowledge of marine life, training to act in emergencies, special knowledge to ensure the correct use of equipment and most importantly expert knowledge of local conditions that can affect the snorkelling safari such as tides and currents, weather conditions and local shore profiles. The value of a Snorkelling Guide with a good understanding of tides and currents to ensure a safe guided experience can never be underestimated. Choosing poor locations and being ignorant of tides and currents can mean a constant battle with waves and surf and can lead to a variety of injuries and even death due to drowning. Exhaustion can set in easily, even with experienced swimmers, if you choose to go out when conditions are not good. 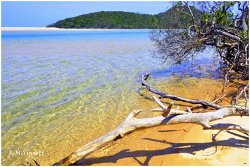 Snorkeling trips in areas that are affected by the tides should be planned for slack water when there is little movement of water (Slack water is the brief interval between the shifting of tides during which tidal currents are at their weakest). Strong tidal currents can also have an adverse effect on visibility that would greatly limit the enjoy ability of the experience. Snorkelling around rocky shores and inshore reefs, allows a closer look at many sub-tidal species that cannot be seen on rocky and sandy shores. Some of these can be seen in the pictures shown with this article. While these are beautiful to see, an ill-informed and unguided guest can also spoil his/or her snorkelling safari by accidental or ignorant interaction with marine life, leading to personal injury and unnecessary damage to the marine environment. 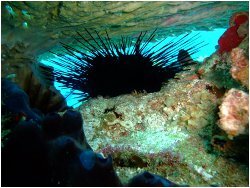 Special care should be taken to avoid species that bite or sting such as Cone Shells, Jelly Fish and Sea Urchins. Another danger of serious injury, is surprisingly often overlooked by snorkelers and can make the next few days of a well-earned holiday sheer misery – be very aware of how long you are out in the water with the harmful UV rays of the sun on your back and legs. Severe sun-burn can easily occur so make sure your guests wear enough protection in the form of long-sleeved rash-vests and protective sun-creams. 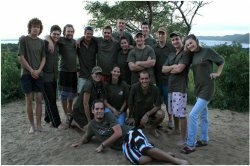 Snorkelling guides can also add huge value to a snorkelling safari by providing some guidance on the correct use of seemingly obvious equipment. The potential frustration that can occur as a result of a lack of knowledge and experience can turn a potentially awe-inspiring experience into a frustrating struggle for a guest to find see what you are trying to show them and keeping their masks clear. Bhejane Nature Training has put together a specialist Snorkelling Certificate to enable FGASA qualified Marine Guides to add to their skill-set and to ensure that you can offer your guests a safe and memorable snorkelling experience while creating awareness and interest in the many treasures we have in our living marine environments.